Lighting – it can change everything. 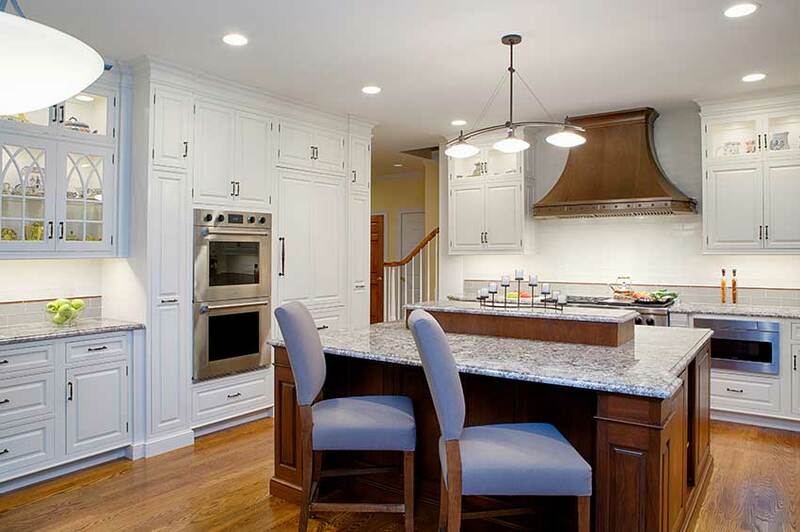 When you’re looking to reinvent the feel of your kitchen, lighting may be all you need. So many trends and fixtures are on the market that it can seem overwhelming. The key in this moment is to go with what you love, while keeping in mind what works for your home. If you’re home has a country-cottage feel, stark LED lighting is likely not your best bet and conversely, antique-style lighting may feel out of place in a sleek modern setting. Changing the light fixtures in your home can instantly give your kitchen a timeless update. Lighting can add warmth, joy, and style to the heart of your home. When it comes to your kitchen, it’s likely a room where family gathers. Particularly if you have little ones, you don’t want lighting that gets hot, such as traditional bulbs, in reachable areas, like directly underneath cabinets. If you do want lighting down low, LED is a better option. LED lighting does not put off heat, which drastically lessens the risk of fire. When kitchen lighting springs to mind, you may picture one large light in the center of the room, or possible a few pendant lights strung over bar seating. It doesn’t have to be this cookie-cutter for your kitchen! Layered lighting, or installing several different sources of lighting, offers the ability to create the right amount of lighting for any moment. For breakfast, you may want just a little recessed cabinet lighting to complement the sunlight for a natural glow. For an intimate evening dinner and glass of wine, you may want just the softest bit of light on a dimmer switch high above. For a late-night study session, it’s nice to have the option of multiple, bright lights. With layered lighting, you can create the perfect mood anytime. Certain types of lighting will create shadows on your workspace. Be sure that the light over a counter area or kitchen island hangs in such a way that it won’t create shadows. Not only does this make for a better cooking experience, it’s safer and more practical for chopping and dicing. Recessed lights on a dimmer switch are a favorite of many households, and not just in the kitchen. Still, for many of the same reasons that layered lighting is a great option, dimmer recessed lighting is also an excellent choice. Having the freedom to choose between super bright, precise light and dim, inviting light is the right blend of practical and luxurious for a room as versatile as the kitchen. If dimmer switches are one of those features you’ve always wanted, the kitchen is a great room to try it out. You can’t go wrong! No matter what fixtures you select, buying the right bulbs makes a huge difference in setting off the fixtures themselves. Harsh, bright LED lights are out of place with certain décor, giving off an intense white glare reminiscent of an office space. By the same measure, warm, soft light may not be bright enough for your taste or the style of your kitchen. Be sure to look at the lit bulbs wherever you buy supplies. Don’t install them all, only to realize you hate the tone of the lighting. Light up your kitchen; light up your life!